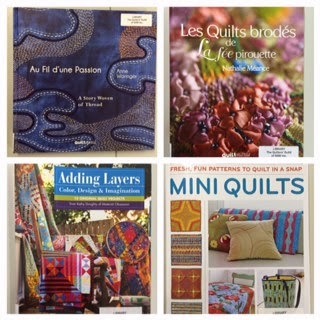 This month we will be welcoming Deborah Laurie to the Guild Office to share her quilting story. Not that Deborah is a stranger to the office! Despite only joining the Guild 9 years ago, this prize winning quilter is a volunteer extraordinaire, from Frame Hirer liaison, right through to the recent amazingly dedicated stint as Exhibition Secretary. 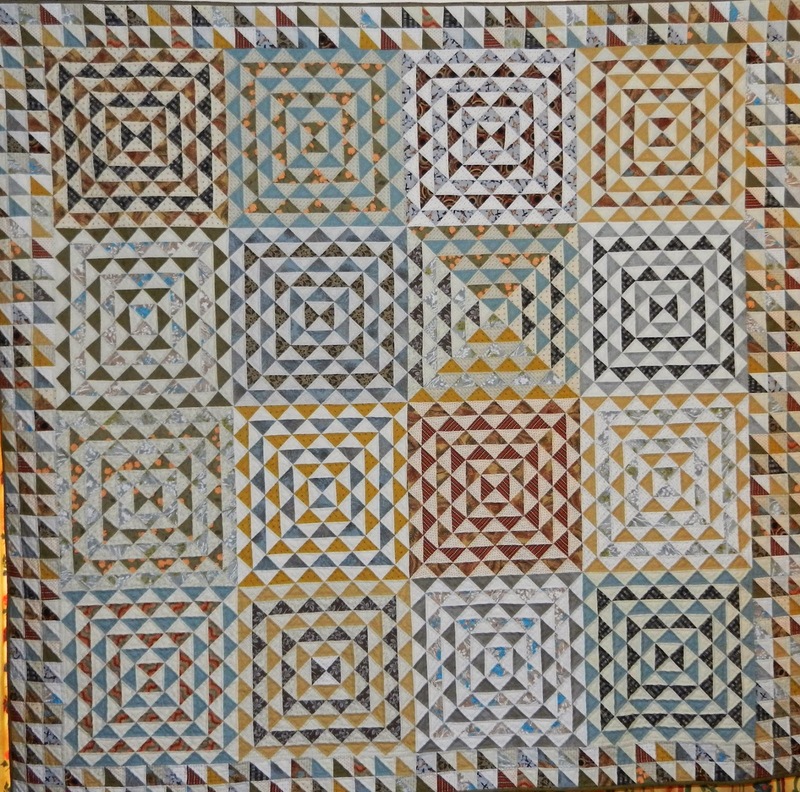 In fact Deborah has been so busy with the Guild that it is humbling to realise that she has managed also, to fit in seriously productive quilting time too! You are invited to hear Deborah tell her story, starting from the commencement of patchwork classes in 2003, and to view her inspiring creations at this next 'Friday Showcase'. If you have some free time this summer, why not get in early and construct a Mosaic Block or two for the February General Meeting? This 8 inch block (finished) has a very popular name. In fact there are more than 40 block designs with the name "Mosaic". It really refers to a block that has a centre square, which becomes built up to a larger square with the addition of triangles or other shapes. Erica Spinks, our BOQ Co-ordinator has asked for turquoise and purple fabrics combined with white-on-white to produce this easily rotary cut, dramatic block. It's not all that difficult to construct : no "Y" seams, as it is diagonal rows that are sewn to each other. 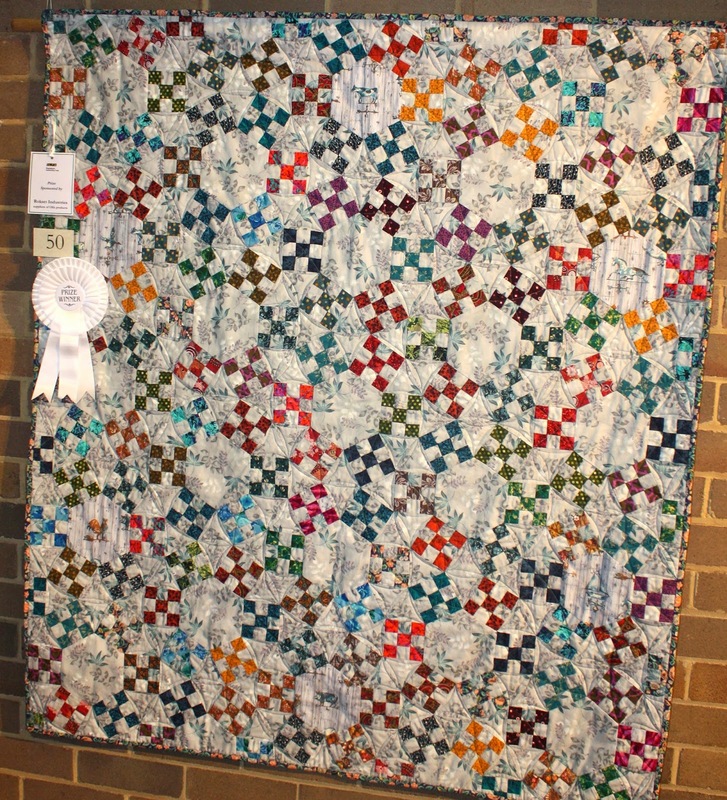 What a great scrap quilt it will be for the "winner takes all" at the Feb Meeting. Full instructions can be found on page 37 of the November 2014 Template. The Office of The Quilters' Guild of NSW Inc. will re-open on Monday 12th January at 10am. Here are several titles to whet the appetite!